Mumbai: Shares fell more than 1% on Wednesday as investors faced up to a poor corporate earnings season and a populist move to cut petrol prices sent shares in the country’s biggest fuel retailers to their lowest levels in up to two-and-a-half years. Shares in HPCL fell as much as 7.3% to their lowest level since May 2009. IOC shed 3.9% to a low of over two years, while BPCL shares dropped 6.2% to their lowest level in more than 18 months. “There is not a lot of encouraging news at the moment," said Nitin Khandkar at Nitin Khandkar Institutional Research. “The markets have gained quite a lot in recent months during the results season... So we were overdue for a correction from higher levels." 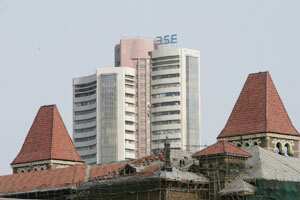 At 11 am, the main 30-share BSE stock index was trading down 1.14% at 16,690.31 points. Twenty-two of its components were in the red. The market has fallen for four straight sessions thanks to a slide in quarterly earnings across industries in Asia’s third-largest economy and a lack of confidence in measures to curb stubbornly high inflation. Shares across Asia fell on Wednesday as signs that rising borrowing costs were affecting AAA-rated France stirred fears that contagion from Europe’s debt crisis would spread to the core members of the region. Automakers topped the gainers in the BSE benchmark index, as the petrol price cut was seen giving respite to drivers’ wallets and manufacturers who have seen sales slide in recent months. Mahindra & Mahindra and Tata Motors saw shares rise as much as 2.6 and 2% respectively. Shares in Tech Mahindra, India’s fifth-largest software services firm, fell 3.2% early after it warned of a slowdown in spending in Europe, the second-biggest market for India’s $76 billion IT industry. The stock later trimmed losses to 1.9%. Troubled airliner Kingfisher Airlines saw its stock rise as much as 2.5% as the market reacted well to a defensive attitude from the firm’s chairman on Tuesday despite a doubling of the firm’s losses in the quarter to end-September. At 11:00 am the 50-share NSE index was trading down 1.3% at 5,002.00 points. In the broader market, declines outnumbered gainers in the ratio of 2.4:1, with about 170 million shares changing hands. Among Asian markets, the MSCI’s measure of markets other than Japan was down 1.5%, while Japan’s Nikkei was down 0.6%. • Steel Authority of India Ltd fell as much as 6.1% after the state-run steel firm was removed from the MSCI India Index. • Bharti Airtel, India’s biggest mobile carrier by subscribers, rose up to 2.6% after the firm was added to the MSCI India Index. • Sintex Industries dropped as much as 9.3% after Goldman Sachs removed the firm from its conviction buy list on account of European exposure and foreign currency convertible bonds concerns.